Friends, there’s a holiday this weekend that we should be celebrating with mimosas, flowers, and massive quantities of waffles with whipped cream. Galentine’s Day is February 13, and it’s the day when “friends leave their husbands and their boyfriends at home and just kick it breakfast style. Ladies celebrating ladies. It’s like Lilith Fair, minus the angst. Plus, frittatas!” Sorry dudes, but uteruses before duderuses, you know what I mean? 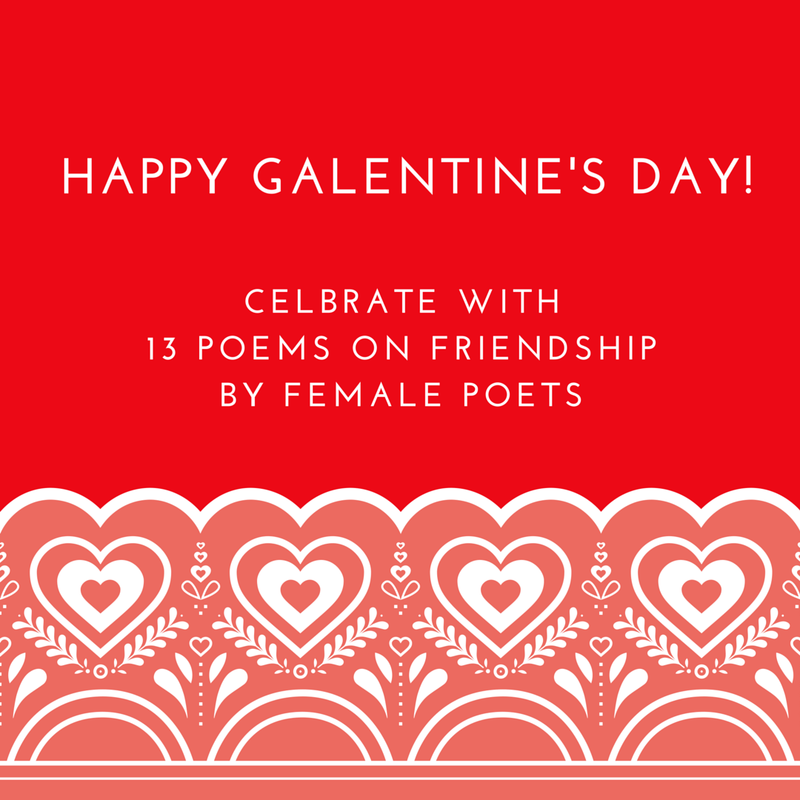 So, in honor of Leslie Knope and in celebration of Galentine’s Day, here are 13 poems on friendship by female poets. Some are elegiac, some are sad, some are funny, some are opaque, some are straightforward—but all are by talented ladies, and I hope you like them. Yes! That is totally in the spirit of Galentine’s Day! My husband and I are throwing a “Cleopatra Party” to watch the great Liz Taylor, Richard Burton, Rex Harrison movie with two of our daughter’s young teachers and another school friend, on Feb 13th. Mostly girls, except for the husband-chef. Does that count? Definitely counts! Happy Galentine’s Day! Oh, I wasn’t aware of Galentine’s Day, so I have already arranged with some friends to kick it, but with a couple of husbands included! Next year, I’ll leave my husband home! We’re having a tea, and although it’s mostly women, my husband and one other are coming. I think they want some cake! I love tea. And it’s so hard to find a good cup of tea out and about. Have just realized that I have (unintentionally) planned a vintage clothes shopping trip with one of my closest uni friends for Galentine’s. Well done us! Indeed! Well done you—find anything fun? I don’t think I’ve ever run across anything vintage in my size, except for my grandmother’s sunglasses. Which I can’t wear. Le sigh. A petticoat! That’s amazing (and good for Collectif!). I hope you’ll write a post to tell us the occasion of your flouncing. What a great idea! I bet many of us women have been doing it for some time now without realizing it. A girlfriend of mine used to always lament being single on Valentine’s Day, and we would celebrate the day by getting take out (she’d stay in the car and make me get the food – “You go; I’m not wearing a bra.”) and renting depressing movies. We had such a good time! You need to write that scene in a book! This year it was too cold in Boston to go anywhere for Galentine’s (or Valentine’s), but I did email a few friends, at least . . .